Learn about and explore various opportunities to learn about computer coding. We will use coding languages like Scratch, Processing, and Python. During the course of the club meetings individuals/groups will develop a program to show off to Woodland students at the Woodland Elementary STEM Night. Regular club meetings will be on the four Thursdays in January (5, 12, 19, and 26) from 3-4:30pm. On January 31st, there will be a showcase event at the Woodland Elementary STEM Night. Club members will have the opportunity to show their creations off to students and parents. Participation at the Woodland STEM night is not required, but highly recommended and appreciated! This club is open to all students at Kingsford Middle School. The learners will attempt, fail, retry, help each other, and be self motivating. We will create a game called "Catch Them All" during this event. While creating this game you will learn how to: start a program, move a sprite, create loops, create variables, and create sensing blocks. 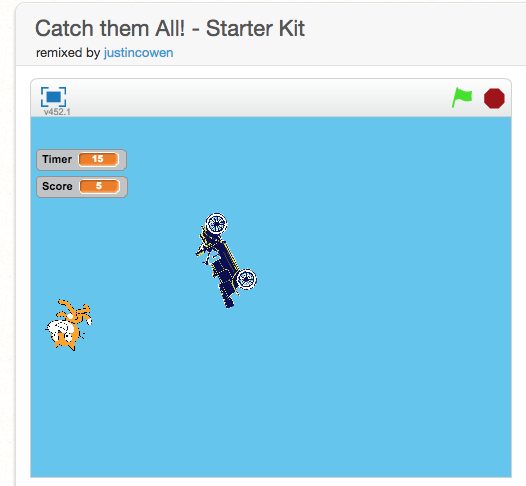 Mr. Cowen will walk you through how to create this Scratch game. Please visit the starter project here: Catch them All! - Starter Kit.